Are you feeling overwhelmed by all of the content you should be producing… and aren’t? Let’s face it. We all know how important creating quality content is for our business–the sort of content that shares your message, showcases your expertise, and builds your audience. And we’re also busy. Often we’re too busy to remember to write that blog post, hop on Facebook Live, or send an email to our list. Between caring for our clients, managing the behind-the-scenes of a business, and living our lives, it can feel impossible to keep up. 00:00 – 3:24: Welcome and Introduction! 3:24 – 10:55: Why your content strategy keeps breaking. 10:55 – 15:39: How to remain visible and present during your busiest times. 15:39 – 27:48: Three ways to get your message to reach more people. 27:48 – 29:47: Wrap-up and links to roadmap. 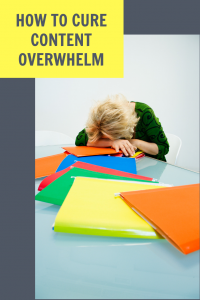 What is content overwhelm and why does it happen? You decide that you need to be more visible. So you ramp up your time creating and publishing content on your platform of choice. Maybe it’s a blog post a week. Maybe it’s an Instagram post a day. Maybe it’s being more active in your Facebook group. Whatever it is, you’re doing great for awhile. You’re been consistent. You’re posting. You’re engaging. You’re starting conversations. A big client project lands in your lap, or you get sick, or your family wants to see you once in awhile. And suddenly, that commitment feels WAY too overwhelming. So you skip a day. Then two. Then a week. Then a month. And the guilt starts to sink in. Your grand plans have fallen apart and now you have to start over. You promised yourself! Ugh! After berating yourself for being a terrible business owner who isn’t cut out for this visibility thing, you rally. You revisit your commitment, hop back online and begin the cycle again. There are a lot of contributing factors when it comes to content overwhelm. Life has no lack of curveballs to fling in your direction. But lets take a look at the content strategy itself, and what causes it to breakdown when life gets busy. Look any direction and you’ll find about ten people telling you how to create successful content. A lot of that advice is good, solid advice. There’s nothing wrong with following advice on how to create solid content (after all, you’re reading a blog post on that very topic right now). But if you’re listening to every single “should” out there, you’re going to set yourself up for exhaustion. Experts love to should on their readers. They tell you that you “should” do something, your content will fail. At the end of the day, you know your business best. Take all advice (including ours!) with a grain of salt. Look to your audience, your strengths, and the things that light you up most to make your final decision. That way, you aren’t stuck feeling weighed down by someone else’s content strategy when life gets busy. Try different things. Look for what’s light and easy and makes sense for you. We’re starting with this tip for a reason. Every single piece of advice following this one can qualify as a “should”. Take it in, figure out if it works for you, and leave what doesn’t. This is your business, and the best thing you can do for it is create a strategy that works for you and your audience. Every business has “the stuff they’re known for”. This is your area of expertise, and it’s usually one broad topic and several subtopics. We call these categories pillars because, like pillars in a building, without them, your business would crumble. If you don’t know what your pillars are, you’re going to feel less focused when it comes to creating a content strategy. As a result, it will be harder to create content when you’re busy. We recommend no more than three pillars in your business. Our own business creates content that falls under one of these three pillars: messaging, strategy, and thought leadership. You’ll notice these are also our three blog categories here on this site. This is probably the biggest cause of content overwhelm. Whether you’ve been in business for one year or ten years, there’s this undeniable urge to constantly create brand new content. We tend to think of content we’ve already created as subpar, for some reason. As if once we hit the “publish” button it’s no longer worthy of our time and attention. But that couldn’t be further from the truth. This very blog post will inspire content for Pinterest, Instagram, and Facebook. It will go out to our email list and (since it’s accompanied by a video) onto our YouTube channel. This content can easily become dozens of social media posts that can be used now and in the future. Here’s the big secret: You do not need to have fresh content all the time. It sets you up for burnout and, frankly, does a disservice to your past content. So if you know a busy time is coming up, and you know you won’t be able to churn out new content, look at what you’ve created in the past. Dust it off, update it if needed, and let it enjoy the spotlight once again. Want to learn more about how to repurpose your content? Click here. When life gets busy even something as small as a Tweet can feel overwhelming. At times like this, it’s important to celebrate the small wins in your visibility game. Every small thing adds up, and it doesn’t need to be part of a big, convoluted strategy. When you give yourself permission to take it slow, it will be easier to keep content overwhelm at bay. What is my current business goal? What is the minimum amount of content to help me achieve this goal? In the book Show Your Work by Austin Kleon, he talks about the power of a single peek behind the scenes. He goes on to remind his readers that a year can seem overwhelming, but a year is made up of 365 individual days. If you just commit to doing one small thing a day, you’ll look back ayear from now and be amazed at what you’ve accomplished. Alright, so at this point you have permission to post less, repurpose more, and find what works for you. But how do you make sure you’re still reaching people? You don’t want your audience growth to suffer when you’re busy and overwhelmed. Before you go out searching for new audience members, work on engaging those you have. This may seem counter-intuitive, but the conversations you start within your existing audience have the potential to draw attention. Everyone has an opinion, but often they need to be invited to share it. Ask them questions and allow your content to be a dialogue–not a monologue. In this way, our clients become active participants in the content. Our audience is made up of humans and they are interested in our stories. Think about what you can write that may deviate from those pillars we mentioned above (see, we’re breaking our own rules!). What can you write that causes more wonder or intrigue? Can you give people a peek behind the scenes? Then, take it a step further, and engage with others. Business is all about relationships, and it’s not a one-way street. Yes, we already talked about this. But it’s so important that we’re bringing it up again. 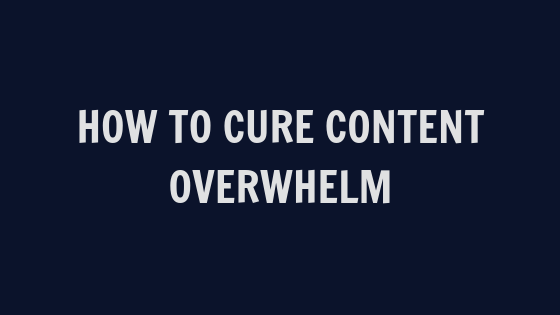 It is, hands down, the best way to cure content overwhelm. Not only does repurposing get you off the hook when it comes to creating new content, it gives you a chance to put your content on new platforms (and in front of new people). Create a content inventory: This can be a simple Excel spreadsheet or Google Sheet, or you can get fancy. Regardless, keep track of what content you have and keep your content in a central location. There’s nothing worse than losing that epic post that had the potential to go viral. Focus on one piece of core content per cycle. We consider a “cycle” once a quarter, but you can choose a time period that works for you (every 90 days). We focus on creating one detailed piece of new pillar content during this period. When this is the only new content we’re responsible for, it allows us the freedom to spend the rest of our time repurposing. And that’s all for Episode 22: How to Cure Content Overwhelm. Thank you so much for joining us (live or via the replay). We’d love to know what you do when you feel overwhelmed by content. Leave a comment and let us know. Catch the Leadership Forum when it goes live! Head on over to our Facebook Page and give us a “Like” for future episode notifications.